Prior to power sawmills and corporate lumber production, much of the carpenter’s project time was filled with simply making trees into boards. 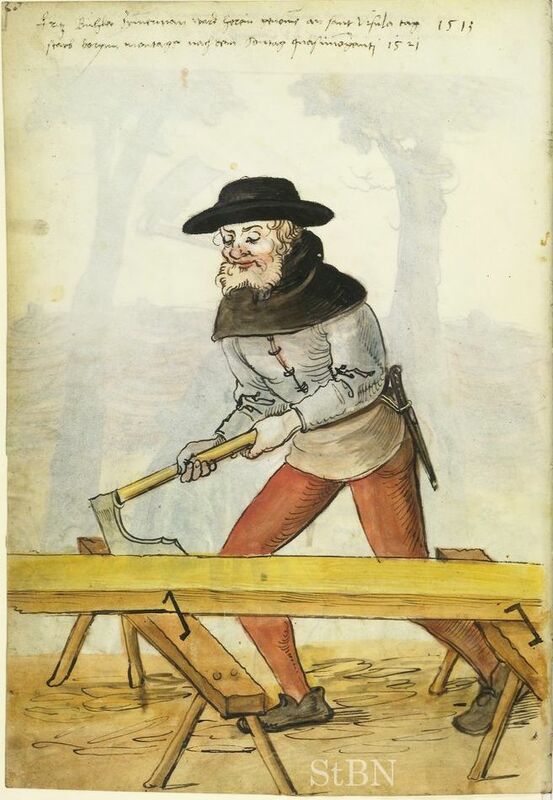 Most illustrations I have found of preindustrial carpenters feature someone hewing, planing, or chiseling with the occasional scene of sawing a board to length or width. An image or map is as much about what is chosen for inclusion as what is left out. I love to ponder the details. These images are no doubt biased in what they choose to show. There is a semiotic tradition in Medieval illustration to choose certain symbols to denote specific trades or historical characters and it should be remembered that the illustrators are not necessarily overly familiar with the trade they are depicting. If I were to let my hair and beard grow out a bit, I think I could pass for this guy. 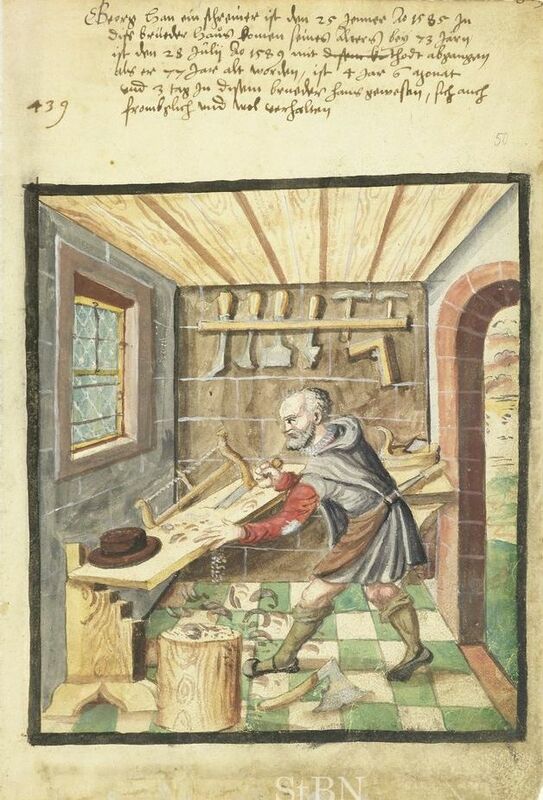 Here we have the same carpenter from our previous post from around 1414. The foreground holds a familiar skirted six-board chest with iron hinges and an escutcheon plate around the presumed locking mechanism. Either he is building these or perhaps it holds his tools. Beside it is a nice little cabinet of similar construction. He is working on a simple European bench with through-tenon legs, popular since the later Iron Age. His board is secured simply by four bench dogs. Only four hand tools are shown. The frame saw, plane, chisel, and mallet. No doubt his dividers, straight edge, and winding sticks are in the box. 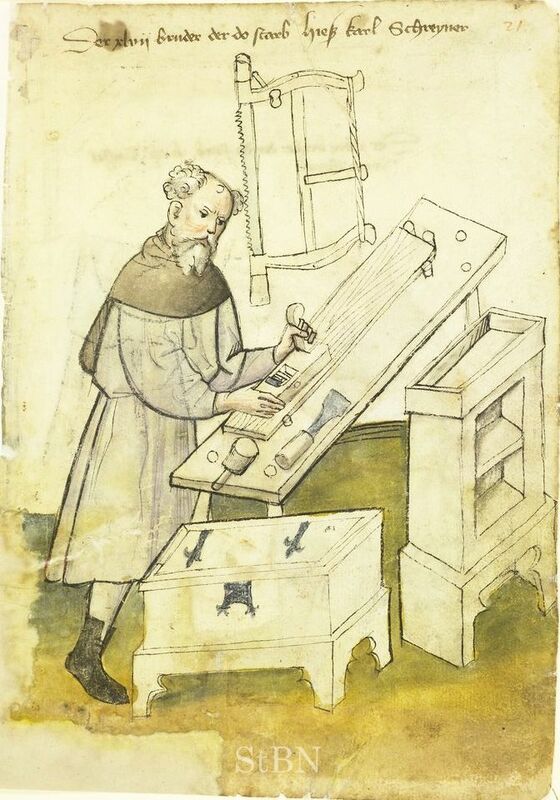 And finally, a late 16th century carpenter cross-cutting a plank. I like this image as it depicts more tools, though in less detail. Chisels, hammers, and a square hang on the wall, a plane sits in the background, and the broad-axe sits on the floor next to the hewing stump. The frame saw hasn’t changed at all. I don’t know if the supprt under the board is unique but it appears to be stepped to hold planks at graduated levels. Nifty. And a couple of details about the clothes; I like the sagging stockings and the patched elbow of his shirt. Definitely dressed for work. Terrific post today! Love the historical stuff! The guy with the saw is just about to pinch his saw blade as he approaches the end of the cut. Details there remind me of St. Joseph in the Merode altarpiece. Are you familiar with Villard de Honnecourt’s sketchbook?